The Owners of the Soon-to-Be-Closed Dog and Pig Show Talk About What's Next | Food and Drink | Style Weekly - Richmond, VA local news, arts, and events. 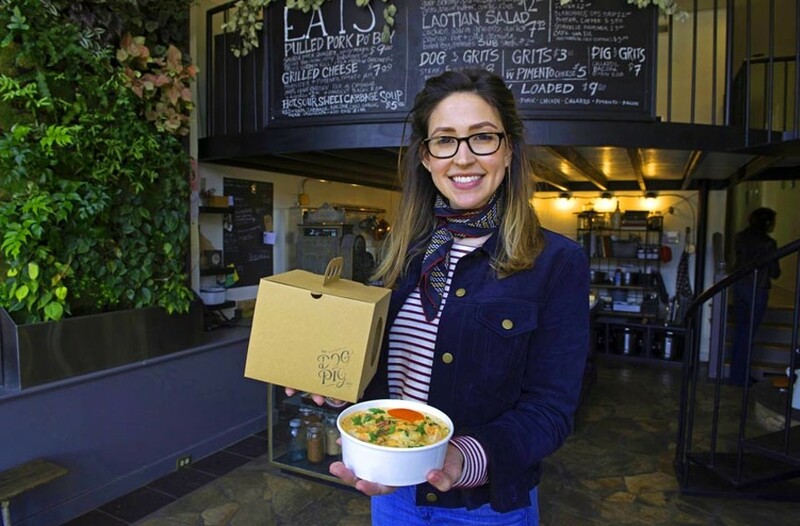 Scott Elmquist Co-owner Isabel Eckrosh with an order of shrimp and grits at the Dog and Pig Show— the takeout spot will close on Feb. 12. The Dog and Pig Show’s Isabel and James Eckrosh are expecting a baby boy in a couple of weeks. They’re also closing their beloved takeout spot Feb. 12, right before their son is born. But this life-changing event isn’t the main reason the couple is shutting down the place. The lease on the building also is up for renewal. “[The baby] definitely helped us make the decision,” Isabel Eckrosh says. The Eckroshes began a secret supper club back in January 2014, after they moved to Richmond from New Orleans, where James was working as a chef at Surrey’s Uptown. They originally wanted to start a food truck, but when the Church Hill space became available, the two jumped on it and took over the lease. “We just wanted to be somewhere,” she says. By the end of the year, her husband was serving such items as shrimp and grits, green papaya salad and grilled cheeses with Muenster cheese, pimento cheese and house-made tomato jam. They knew they wanted to re-evaluate their business at the end of the lease. It also was a natural stopping point, which made the decision to close much easier. So why is the Dog and Pig Show shutting its doors again? It’s fairly simple, she says: “We want to do different things.” Along with the big changes a new baby brings, James is also switching careers and will start a three-year master’s program in kinesiology at the University of Virginia in the fall. He’s a talented chef, but now that he’s in his 40s, she says, the food industry veteran is ready to take on a new challenge. Eckrosh is ready to stretch her wings, too. She studied interior design in college but became a teacher in New Orleans after graduation. Shortly after the baby is born, Eckrosh plans to go back to design and work with Anna and Kate Thompson of Palindrome Creative Co. But the Dog and Pig Show won’t disappear entirely. The Eckroshes plan to sell a few of their customers’ favorite things — pimento cheese, pickled onions, beets and turnips. She’s working on the branding and scoping out retail possibilities. The launch of the product line is planned for late spring or early summer. They may even restart the Sunday suppers. The two aren’t ready to completely let go of the Dog and Pig Show.